The 2019 season for the APC United Late Model Series presented by Grisdale Racing Products will see a major schedule shakeup. 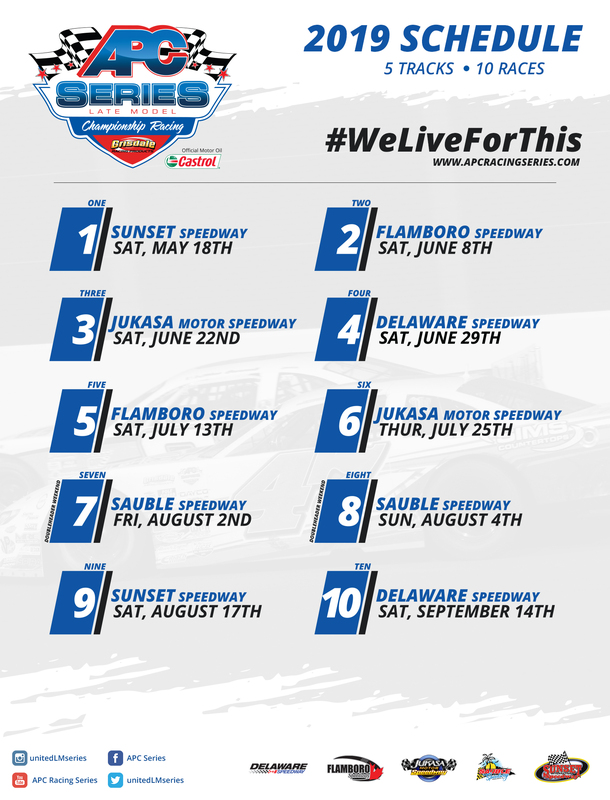 With a return to a 10-race schedule, the tour will make stops at five tracks across the province, with the noticeable addition of a second date at the Jukasa Motor Speedway in Hagersville, Ontario. The 2019 season will kick-off on Saturday, May 18that Innisfil, Ontario’s Sunset Speedway, a familiar scheduled start to the season since the inaugural campaign in 2015. From Sunset the tour will take a handful of weeks off to prepare for Flamboro Speedway on Saturday, June 8th. Race three will see the race teams head to Jukasa Motor Speedway before a quick turnaround to Delaware Speedway one week later on Saturday, June 29thfor the Canada Day weekend celebration. Flamboro’s second event in 2019 will be held on Saturday, July 13th, a race that has seen some incredible finishes in years past. The sixth race of ten will see the tour head back to Jukasa Motor Speedway for a Thursday night showcase of the best pro late model drivers in the province. Another major schedule highlight for 2019 will take place one week later as the tour gets ready for a doubleheader weekend at Sauble Speedway, with race seven on Friday night and the season’s eight race taking place on the Sunday of the long weekend. The final two events in 2019 will see a return to Sunset Speedway on Saturday, August 17thbefore a well-earned rest as the teams prepare for the championship event on Saturday, September 14that Delaware Speedway, part of the Great Canadian Race Weekend at the historic facility. The stage is set for the 2019 season, with an additional race and many challenges sure to be had, the tours fifth season is sure to continue its trend of high excitement, large drama, and close battles. For all the latest stay connected with the APC Series on social media and visit www.APCRacingSeries.comregularly throughout the offseason.